I recently received a' nudge' from a friend, (*waves*) and so I am just posting briefly to let you know that I am still alive. 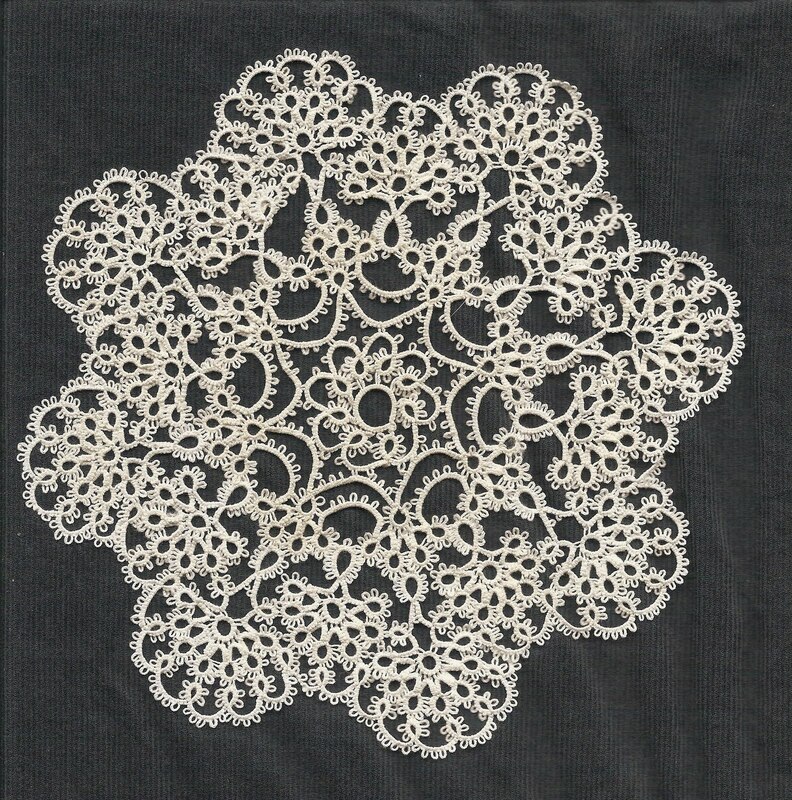 I haven't done much tatting. and really nothing of interest at all. 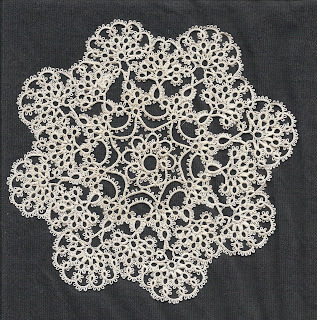 I can't remember where I was with this doily last time I posted, but I guess that I am a bit further on. 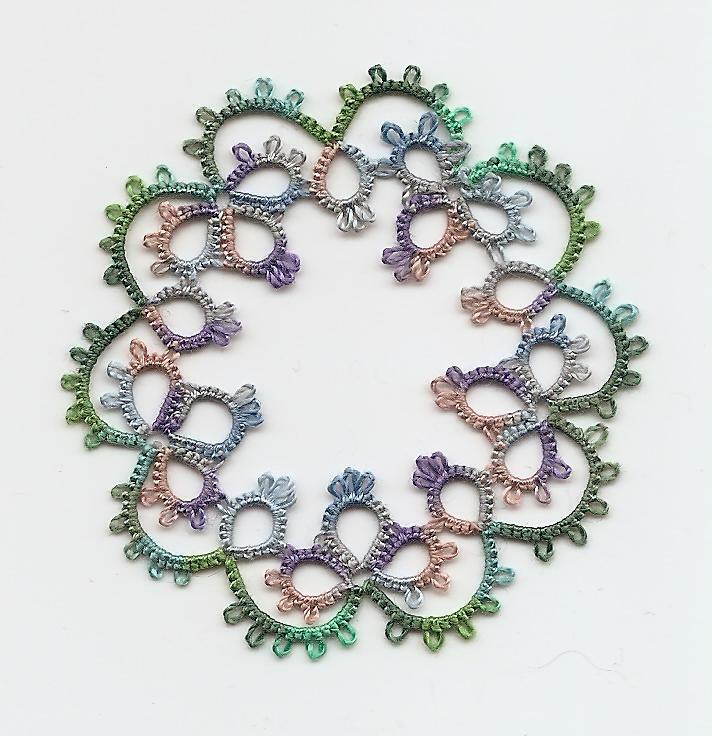 The thread is not nice to use, and it is pretty grubby, but there seems no point in washing it till it is finished, and because I don't like the thread I am not so motivated to keep on going. Hey ho. I have otherwise just done scraps of edgings or else old motifs that I know by heart, to keep my hands busy when I am listening. I have finished the mental health course, but I am about to take the final exams for a French course that I am doing. It helps to tat when I am listening to lectures. 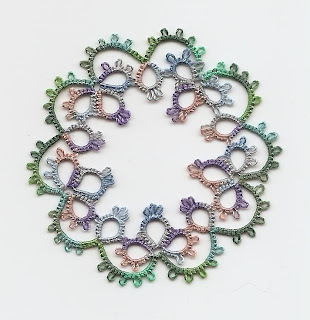 This motif first came to my notice on Fox's page, it was designed by Corinne. She has invited tatters to give it a try, and so I finally came out of retirement to have a go. These threads are Güttermann Sulky, and they were not what I would have chosen, they just happened to be on my shuttles. I should have re-scanned because the colours are brighter than this, but it's late and I don't want to disturb the man. I see on her blog that now there is more to add, but I think I will start again in a better choice of threads...these don't do justice to the form. Tomorrow we are going to Perpignan to fetch a puppy. I think the colors of the Gutermann Sulky motif are divine! Sorry the thread isn't more agreeable. Good luck with the puppy. Thanks and I will try to keep going now!